The act of walking implies a shift of weight, one foot moves forward and the other foot follows giving shape to an in-between status. It is a “continuous process” similar to thinking. This process delineates a path, a series of trajectivities that go beyond a ‘static’ approach to movement. Nicholás Salazar Sutil’s book is a sort of “pedestrian theory, a walking theory”, where movement and its technologically-meadiated representation are investigated according to this in-between vision. 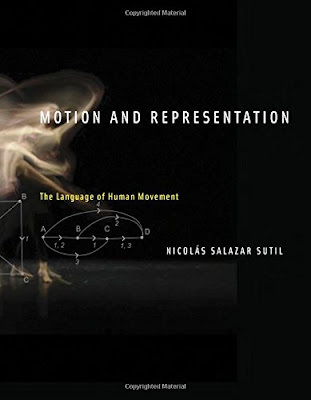 The book follows four trajectivities: “Motion Space”, “Inner Motion”, “Motion Notation” and “Motion Technology”. It is a dense pathway through the attempt that has been made during the centuries to ‘capture’ movement. In this sense, the work of dance theorist Rudolf Laban returns more than once: with the concept of geometrically conceived space, with the use of topology to approach motion coming from within and with the discussion of notation. Choreographer William Forsythe is repeatedly mentioned as well, for example, in regard to his “motion alphabets”, which is a way to develop a kind of catalogue of movement components that have been turned into units capable of evolving. Interestingly, the act of walking becomes itself the object of analyses when the author focuses on the question of logic connected to movement or on logic failure in Samuel Beckett’s “geometric mime” and Bruce Nauman’s “walking videos”. Movement has been analysed from the point of view of classical geometry and even psychology, with, among others, the studies conducted by psychologist Kurt Lewin’s. In particular, Lewin addressed the external representation of movement according to a “dynamic perspective”, focusing on locomotion, whether it be bodily, mental or social. In his films on children’s movement, he showed that human movement is not something already set, but changes as we grow older. For what concerns traditional notating systems, the author expresses strong skepticism for their impenetrable bureaucracy, their symbol-mediated vision and their static approach to movement. He suggests alternatives to them and, in particular, describes computer-based systems where the issue of control is at stake because the performer is no longer in control of his/her movements, but “a cybernetic system” co-controls them instead. With motion capture, the body seems to be dissolving and its presence becoming irrelevant, in spite of the fact that an “enbodied trace” appears to remain, what the author terms “movement outside body”. The book is intellectually challenging for the introduction/exploration of numerous unorthodox concepts like ‘pensement’, created by the author to exemplify “thought behind movement”. It is also rich in informative pictures and filled with engaging examples, sometimes coming from the author’s own performance experience. As it is with Flatland (2012), "a digital dance theatre piece" he created in collaboration with C8 and inspired by Edwin Abbott Abbott’s homonymous peculiar novella published in 1884.